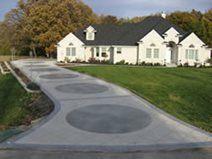 Use the links below to get ideas of all of the types of decorative concrete applications that can be applied to a newly poured concrete driveway. Concrete is placed, with the color integral in the mix or "dusted on" at the job, then stamped. A wide variety of patterns are available to emulate bricks, stones, pavers, or flagstone. A wide variety of colors are available. Colors are often chosen to match stone or other elements around the home. 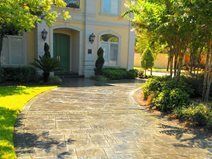 Colors are often combined with stamped concrete. Concrete colors are either added to the concrete at the ready mix plant, or "dusted on" at the project site. Click here to review the colors available from Davis Colors. While concrete engraving is often done on existing driveways- it produces a look like elaborate brickwork at a fraction of the cost. So a plain gray driveway can be poured, then stained and engraved to look like brick. Concrete Art in Newport Beach, Calif., routes designs in the concrete and then applies stains inside the routed out designs for dramatic effect. The routed out area can be stained an offsetting color for a tiled effect. View the color chart for concrete stains. 3/8" colorful pebbles are placed in the concrete at the plant or "seeded" into the concrete at the jobsite. At the right time during the finishing operation, the top layer of cement paste is washed off the surface leaving the tops of the pebbles exposed. Review the section about exposed aggregate. Concrete can be sawed into patterns with a concrete saw or grooved with a hand tool. Often different colors will be used in the different "fields" of the pattern by using concrete stains. The driveway above was plain concrete with many cracks. Concrete Art in Newport Beach, Calif. scored the driveway in a random stone pattern then stained the fields. 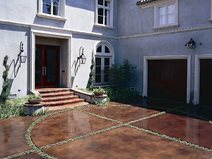 Scott Cohen explains how to dress up concrete driveways by applying layers of color. Get concrete driveway ideas. 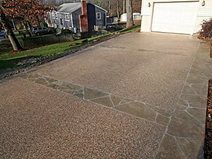 Visit several colored and stained driveways with designer/contractor Scott Cohen where he explains how to decorate your driveway.